The preceding chapter ended on a bit of a downer, with our pirate hero Guybrush Threepwood being betrayed and killed. Luckily, it turns out that being dead is no detriment to adventuring, as Guybrush must explore the pirate afterlife so he can find a way to rejoin the living, get revenge, save his wife and tie up some other loose ends on the way. All the major characters from the series feature in the final episode, although some are stuck in a background role. Alongside them are a few new bit players plus some returning minor characters from previous episodes. None of them are especially memorable, but they do a decent enough job of contributing to the finale’s story. The plot is surprisingly dark, at least by Monkey Island standards. That’s not inherently a bad thing, although it does mean that the humour is a little more sparse, especially near the end of the episode. Beyond that, the storyline provides a pretty satisfying finish to Tales of Monkey Island, although unfortunately the conclusion is rather abrupt and feels a bit lacking. Like every other chapter, you’ll be solving puzzles with a point and click interface, interacting with characters, items and the environment to progress. Aside from a couple of more abstract puzzles this episode gets you thinking without being difficult or unfair. By this point in the series the gameplay has been pretty standardised, and you won’t find any surprises. Most of Rise of the Pirate God involves assembling elaborate voodoo recipes, one of the trademarks of the Monkey Island franchise. This requires a fair bit of exploration, especially when compared to some of the more dialogue intensive chapters that preceded this one. For the most part that’s just fine, but there are a few puzzles that require you to trek back and forth over long distances. This can get a little tedious, as even if you know exactly what you’re doing you’ll still be spending a lot of time walking and waiting for the next screen to load. If you’re not quite sure how to proceed then you’ll be wasting even more time wandering about. It’s not a huge problem, but it does slow the gameplay down and creates a few dull moments. You’ll spend the majority of this episode wandering around the pirate afterlife, which is a great idea but not as well executed as it could have been. The whole place feels drab and dreary, and while that’s arguably an appropriate design choice for an afterlife it also comes across as a little boring. It’s larger than the new areas that have been introduced in the past couple of chapters, which is nice, but the visual design comes across as just a bit uninspired. You’ll also head back to a couple of locales explored in earlier chapters. Recycling settings can be annoying, but there’s nothing wrong with it here because your visits are quick, to the point, and fit in nicely with the game’s story. They also make a nice visual contrast to the grey underworld. The graphical highlight of this episode comes at the end, which involves a rather elaborate showdown on a pirate ship. Saying more would spoil the story, but rest assured that’s it’s an impressive visual sight. 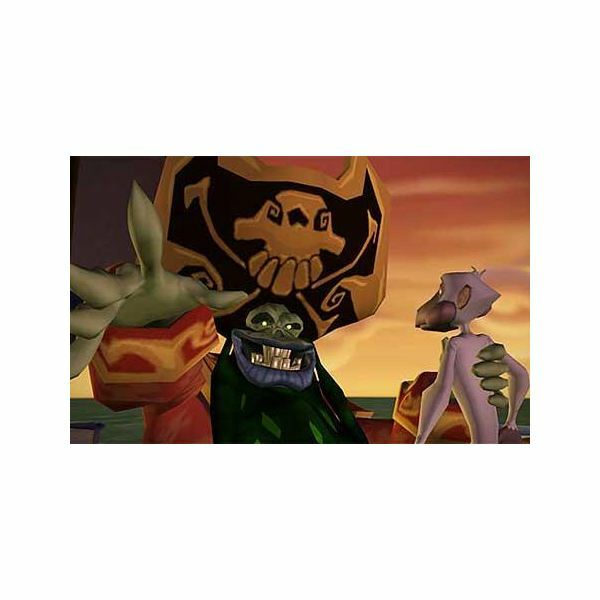 So, Rise of the Pirate God definitely meets the standards for graphics set by the rest of the episodes, even if it is a little bland at times. By this point in the series it should go without saying that the voice acting is fantastic. The main characters are all voiced very well, and they also show a bit more range due to the change in the story’s tone. The same can’t be said for the forgettable minor characters, but they’re still voiced competently enough. 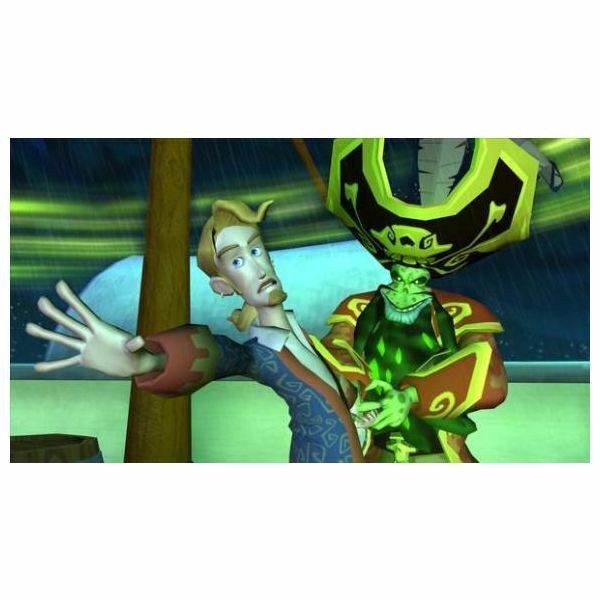 Of particular note in this episode is Dominic Armato’s portrayal of Guybrush. It’s been great for the whole series, but in the final chapter both the more comedic and dramatic moments are joined together very well. The soundtrack retains most of the tracks introduced in previous installments while adding in a couple of new pieces. They’re nothing remarkable, but they do an adequate job of enhancing the music. It’s another enjoyable soundtrack, although anyone playing these games in quick succession will likely find themselves annoyed by some of the repetition. Rise of the Pirate God is not without its flaws, but it’s still a very satisfying conclusion to Tales of Monkey Island. There’s really no reason for anyone who has gotten this far into the series to not see it through to the end, although the final chapter does have plenty of merit in its own right. With the critical and commercial success of Tales of Monkey Island the creation of a second series wouldn’t be surprising, and if one is announced let’s hope it takes the lessons learned from the first to address what few problems the games have had.